Granted, you’ll never smash them all, but it’s worth spending some time on the easy ones to make sure your blogs have a more significant impact. So if you rank relatively low, but get a lot of clicks, your ranking will rise. However, if you rank highly and you don’t get click-throughs, your blog will be deemed irrelevant to that search term, and your rankings will fall. Buying in links (please say you don’t do that) is the quickest way to ruin your rankings. Instead, concentrate on guest blogging for high-quality blogs. As a trusted and high-quality blog, you’ll be expected to link to other high-quality blogs if you want to raise the value of your blog in the eyes of the search engines. OK, yes you could probably write a useful and informative high-quality blog post that’s short, but the search engines love long content. Although none of these ideas are revolutionary, they often overlooked. Simple and easy to carry out, these tips will help you get more out of your blogging. If we retrospect the last decade or more, one trend emerges clearly. The consumer behaviour has switched from analogue to digital. People today consumer information and data through online modes and to keep up businesses need to target the niche. It is what gave birth to digital marketing. It is the sole valid way of reaching the target audience. When compared to traditional promotional practices, digital ones leave the pockets unscathed. While this benefit may not weigh heavy on conglomerates, for small businesses, it is saviour sent from heaven. For start-ups and local entrepreneurs moving to the green zone is a pipe dream and their resources are limited. In such instances, using the internet to reach out to a massive potential customer base is can prove to be life-saving. The icing on the cake is that this increase in awareness doesn’t require a big budget. Furthermore, the digital marketing plan can be customised to employ only those paths that are firmly within the financial limit. When a firm utilises email marketing, SEO and other aspects of digital strategies, they communicate better with the customer and at a faster pace. Additionally, through digital paths, one can reach out, individually, to those patrons that need your service or product. All these factors result in a more significant conversion. A firm can even enter an already established sector through social media marketing and create brand awareness. It might not turn them into market leaders, but it will unmistakably reach an adequate base pool. An impeccable reputation management services is the golden rule of thumb if companies want to survive in the cut-throat competition of today’s industry. How does a firm work on establishing a spotless person? By making customer support a priority. Social media and websites are excellent techniques for generating personal rapport with patrons and offering better support. Through emails, social media platforms and even instant messaging apps, a company that resolves consumer grievances and queries is on the way to succeeding. A rarely recognised advantage of digital policies is access to consumers that are on Smartphones. A study shows that websites that are mobile-friendly see an increase in customers because the patron of today wants to view products on their phone. Any business who fails to make a mobile-friendly application or site loses on a large pool of audience. Small investment. Increased customer base. Extraordinary conversions. These are the three pillars that drive to a massive rate of return when it comes to digital marketing. Simple web analytics can prove to any entrepreneur that an optimised website is offering increased ROI. The result may not be directly through the website but via more email lead generation and sales calls. 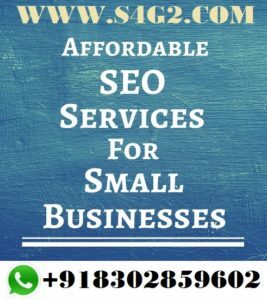 As per definition, search engine optimization is a methodology of strategies, techniques, and tactics used to get traffic from the “free,” “organic,” “editorial” or “natural” search results on search engines. SEO is the process which includes a range of activities to increase the number of visitors to a website by obtaining high-ranking placement in the search query on search engines like Google, Bing, and Yahoo. It is the tendency of the users to visit websites that are at the top of the search engine result page (SERP). SEO enables search engines to fetch the most relevant website in response to a search query. Search Engines use bots or spiders that perform several activities like crawling, indexing, processing, calculating relevancy, and retrieving to deliver results. These bots or spiders crawl the website to understand what a site is about. After crawling, indexing of the content takes place based on keywords, tags, and categories that best defined the website. The indexed pages are stored in the database to be retrieved later during the search query. Whenever the user enters a query, the indexed pages in the database are searched to deliver results based on the relevancy of each of the indexed pages. The activities in SEO are categories as On-Page/ On-Site SEO & Off Page SEO. In the on-page, activities are performed at the website that includes the page title, meta description, content & image optimization, blogging, etc. In off-page, activities like content publishing on third-party sites, link building, etc are performed. Both on-page and off-page optimization are important in order to get on the top of search engine results. It doesn’t matter how attractive or stunning your website is if you don’t get traffic your website is useless. A website is said to be contributing to your business only if it helps in fetching business online. This is possible only when ranked in the top of the searches with the relevant keywords. For this, SEO is essential. Furthermore, organic search is the most vital component of the buyer funnel and engagement. Most of the buyers use search engines like google, yahoo, etc to gather information before making a purchase. In such a scenario, if your website is not ranking then you will surely on a losing side. In this competitive market, SEO is not about just bringing traffic to your website. It is also important for building trust and credibility of the brand in the digital eco-system. In a scenario where anyone from any geography can be your buyer, trust plays a crucial role in delivering engagements. A well-ranked website with content spread across different online platforms offers a better probability of engagements. Search Engine Optimization is also important in the scenario when your competitors have already committed to it. If your competitors have obtained high placement in the search results, you also need to have an optimized website with relevant keywords. Digital marketing is the advertising and promotion of agencies and their brands through digital media channels. Digital media, in the intervening time, consists of websites, social media, radio, television, mobile and even forms of traditionally non-digital media including billboards and transit symptoms. Basically any advertising and marketing media this is delivered electronically is considered digital marketing. Why the focal point on digital media? The shift to digital media is being driven by using marketing agencies, business proprietors and consumers alike. The ever-growing demand to show quantifiable outcomes makes going digital a dream for the digital marketing agency. Most digital media, such as websites, social media and mobile advertising is an easier to track than digital marketing media inclusive of print advertising. For business proprietors, many kinds of digital advertising are very low cost. Having a web presence, attractive customers in conversations through social media and e-mail marketing are low cost options to print advertising and direct mail. Those digital channels are available to agencies of any size, and assist to even the playing field for start-ups, small businesses and independent specialists in search of new commercial enterprise. It’s far encouraged which you work with a professional web design firm that is skilled in web development and search engine optimization. Because your website is the foundation to and from which all different channels will lead, it ought to be considered one of your top business investments. Once you have got your website entire, the next steps would be to launch regular monthly or bi-monthly email campaigns, and connect to clients via social media. In case you are virtually on a shoestring price range, these are efforts that may be finished in-house or for a low price with the aid of an out of doors digital marketing agency. In case you’re interested in getting competitive with search marketing, you could set apart a few digital marketing dollars for search engine optimization (SEO) and pay-per-click marketing. Many companies today rely closely on being observed online to gain new customers. A common misconception among enterprise proprietors is that definitely having a website approach that customers will find it. Not so. Your web page must be built with specific key words and terms, meta data, page content material and linking strategies with a purpose to assist it attain top search rankings. When you have the method, a smart investment would be to interact the offerings of a digital marketing agency to assist for your advertising efforts. These days, many companies provide a multiple levels of service to accommodate businesses groups huge and small. Start-up period is a very critical period, where the business starters should be very calm and cool to get their positions in the field. The SEO Services California has a thin line between success and failure. A single step can throw a boy from success to failure position. Therefore, finding the right expert and assure some good decisions to be on the flow is very important. There are many examples of successful business owners who had depended on the SEO professionals and made a great run. They still acknowledge such companies and lived in the deal for a long time. Tree Photo Video, Hadfield Dental Group, Medifast, Max Tree Removal and there are many in the list, who came with problems and got solutions and stayed in a long term relationship. Some organizations didn’t find any considerable rank in the digital platform and the investment bounced back with loss. The SEO experts had enhanced their page speed, quality of the pages, visibility, contents’ standard and thus the companies could gain more than 60% improvement in average at the traffic rates and the ranks had improved in Google and other search engines as well. Anybody who is thinking of start-ups may experience the steps of achieving some optimistic results in online marketing. The start-up trader can find an appointment with the SEO professional. During the meeting period, the professional would ask a few questions like what kind of business you are starting, what you want from the online market and etc. The professional’s motif is to know the trade details. In most cases, the employees had achieved success in analyzing and making the right strategy. If the client can express his or her wants, then the next steps would be easier. Keywords have opted on the basis of the company’s type, target audience, the genre of the product or service and hit point. Hit point is the most considerable topic in the modern day’s online business. Every company has to have some hit points that would differentiate them in the array. This point should be specific and one-liner, it has to have simplistic communication ability so that more and more people can realize it. The hit point fixes the traffic rate very much. Start-up business traders must have a website or domain first. If they already have it, then the on-page activity work starts. If they haven’t then the web designer plays his role before any SEO work. The page has diverse conditions for getting good rank in Google. On-page activity applies some advance toolkits and techs for enriching the page’s quality and impact. This step creates a different link for hitting the viewer’s mind audio-visually. Off-page activity helps highly to develop the ranking. Generally, people don’t look at the second page, so the web links must be on the first page for more viability. The 4th step of SEO Services California creates links with social media and other popular websites for more views, likes and subscribes. This is the report submitting period where people should be highly judgemental because they are paying for it. The monthly report would show the state of a company before 1 month and after 30 days where it has arrived. Every SEO package of the best company California submits a report every 30 days period. So, clients shouldn’t miss it. Small Business Association (SBA) says that 30% of the start-up trades fail in 365 days, 50% in five years and 66% in 10 years. So, failing possibility doesn’t remove before a business can pass 10 years at least. The business experts say that any trade has to struggle for 10 years if that wants to stay in the field for long. So the 10 years slab is very crucial. This failing tendency has a terrible scenario in California as well. The Californian Bureau of Statistics says that 97% of businesses are a small business in the country. There are 60% of start-up businesses what close their operation within 3 years. In a country where small businesses are playing a vital role to control the Nation’s economy, such a scenario may bring a deep financial crisis in the future. So, taking some good decisions like SEO Services California is highly penetrating for not being ceased and supporting the country’s economy. SEO is back bone of today’s digital marketing world. Without SEO your website likes a shop in without crowd area. Digital marketing makes your website visible in Internet. There are lots of sites and lots of competition in his era. It’s very tough to find best one. Reason is very clear if you make your your site without discusses with SEO experts. Google makes your website in Search Rank. Search Engine Optimization Delhi NCR one of the competitive place for SEO. Then very hard to recover it. You should care about selection of Best SEO team while your your site under constructions. On page SEO role in Digital marketing around 90%. There are two categories of SEO On page SEO and off page SEO. Very crucial role of Website Design and Redesign Delhi NCR on Page SEO. On page around more than ninety percent parts it’s depend on web designing. There are some points should be make clarity of web designing role in SEO. Your website should be eyes catching. Good site is very important for control the bounce rate . Bounce rate tries to be more than 30 seconds. Meta content is very important. Meta keywords should be related to main keywords. Meta descriptions should be very easy to not more than 240 words. Page speed should be maximum. Web page should be open in minimum time. YOAST and ALL IN ONE SEO plugins very helpful while you making your sitein WordPress. According to new mobile algorithm of Google your website should be responsive in Google mobile search result. Without responsive website is very hard to make top rank in Google mobile search. Content is always king in on-page SEO. Content should be unique and high quality. Language of your content should be very easy readable of primary student. Font always play role in on-page SEO , font should be clear and easy to read. Some suggested fonts are Times of New Roman, Arial, Calibri, and Verdana. Image of website should unique, clear and small in size. Alt tag should be including with all images. Title tag must be in sequels, all title tags must be arranged a specific formats. Paragraph line of content small, readable, easy form of English and small paragraph parts. Important words of content should come with strong tags. Links should be easy related to keywords. These are some most important parts of On-page SEO. Developers should consider above point. There’s no doubting the fact that SEO remains an important tactic business should use in order to drive growth. As more people and organizations depend on the Internet for the products and services they need, businesses will have to invest heavily in terms of improving their online searchability. Still, we will have to admit that while SEO may look easy, it truly isn’t, especially for startups that want to compete for customers through their websites. It takes time, and given the fact that it’s a considerable investment to think of, you will have to make sure you use the right approaches that can help you improve your SEO campaign. If you’re using WordPress as your main platform for hosting your website, you basically have various tools that can help you improve your SEO campaign. Plugins such as Yoast, for example, can help you optimize your blog posts for better searchability. Other than SEO, the plugin also provides suggestions on how you can make your content readable. For Wix and other free-to-use website builders, you can definitely take advantage of the many SEO for free website tools available on the web. At any rate, it takes time to learn how to use these tools, but you will still be able to drive your goals once you have already learned the ropes. Search algorithms: how do they work? Well, they work towards providing equal opportunities to everyone who wants to make it big on the Internet. Every year, Google rolls out new updates to its search algorithm, with increasingly stringent rules. In this sense, it’s important that you learn about these algorithms, identify any areas of opportunity, and issues you should keep to mind when recalibrating your SEO strategy. Presently, Google is using a broad core algorithm update, which makes it harder for businesses to recover after they have dropped out of the search rankings. What’s more, the update puts greater emphasis on optimized content, which pushes businesses to be more aggressive along the lines of improving the quality of their blog articles and other content assets. You can’t achieve SEO success without having the right people handling your campaign. In this sense, it’s important that you focus on hiring people who actually have considerable experience in the field. For this, make sure you have a corps of content writers who can help you create valuable blog articles. You also need SEO specialists who can conduct keyword research. At any rate, you’ll find that you have better chances of hiring the right people through freelancing platforms. Especially if you’re still a startup, you will have to keep your hiring costs down without sacrificing your search for the right talents. Once you have already set up your business from this first phase, you can then proceed to building an in-house team. For this, make sure that you prepare company SEO standards so that all your efforts are consistent throughout.